This family owned and operated company has been producing award winning wines in Napa and Sonoma for over 14 years. Desert Rock Winery's new Scottsdale tasting room has just opened - with full tastings, wine by the glass, as well as private tastings. Desert Rock is all about full scale wine productuion, from grapes to bottle! What to know more about wine? This is the place to start! Love this restaurant? 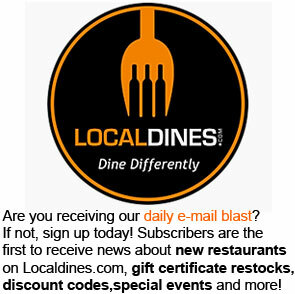 Want to be kept informed of their latest happenings, deals and specials? If so, click "Sign Me Up!" and fill out the form to be added to this restaurant's VIP Subscriber list! Availability: This certificate is limited to 2 per household every 90 days. Not Valid with Happy Hour Pricing or Special Events. Valid for Dine In Only. No cash value. No change or credit will be issued. Not valid toward tax or gratuity. Not to be combined with any other certificates, coupons, specials or promotions. Not valid on holidays. Only one (1) certificate may be used per table. Promotional Value ($30) is valid through expiration date. Amount Paid (see your account) does not expire. Email Email will not be displayed. Date of Visit Enter the date you visited.